Thank you for visiting us at the Midwest Horse Fair! We had a wonderful time talking mini donkeys for 3 days! Timber Lane Acres Miniature Donkeys is located in southeast Wisconsin just off Interstate 94. With many years of experience in raising, training and showing several breeds of horses and pedigreed Rex rabbits, we have fallen in love with these unique creatures of the equine world...the Miniature Donkey! variety of colors but have chosen to concentrate our program on dark spots along with blacks and browns, available for pet, show and breeding. The miniature donkey truly is an enjoyable animal to have around. They love to give hugs as much as they love to receive them. Donkeys are very herd oriented and bond closely with other donkeys. They do not do well as a solitary animal. Therefore we will only offer donkeys to homes with other donkeys or other good companion animals such as ponies, horses, llamas, alpacas, sheep or goats. 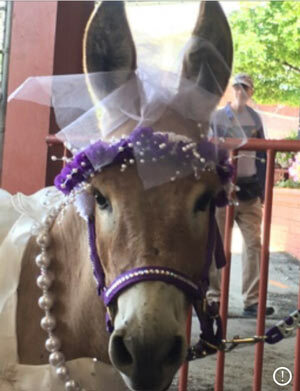 We look forward to visiting with friends, new and old, who share our interests for the Miniature Donkey. Visitors and inquiries are always welcome...just call ahead to make sure we're home! Click on our 'Festive Donkey Ventures' tab, to see where we're taking our mini donkeys! Starting to book into 2019 & 2020! Contact us today! 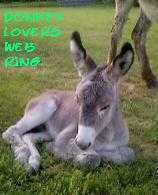 This RingSurf Donkey Lovers Ring Site is owned by Walt and Jill Coussens. owned by Timber Lane Acres.